Wolves belong to family groups called packs, they usually consist of eight to fifteen-members. The rare exception is what is popularly know as a "lone wolf", this wolf would most likely be the lowest member of a pack (the omega) that was driven out of the pack, if it is lucky, the "lone wolf" may find a mate and start a new pack. The alpha pair has the greatest amount of social freedom among all the pack members, but they are not "leaders" in the human sense of the term. The alphas do not give the other wolves orders; rather, they simply have the most freedom in choosing where to go, what to do, and when to do it. The rest of the pack usually follows. There are various subordinates, who dominate the omega. The omega is the lowest. It is the baby-sitter and usually more puppy than wolf. In larger packs, there may be also be a beta wolf or wolves - a "second-in-command" to the alphas. In addition, one wolf typically assumes the role of omega, the lowest-ranking member of a pack. These individuals absorb the greatest amount of aggression from the rest of the pack, and consequently enjoy comparatively few individual privileges. While most alpha pairs are monogamous with each other, there are exceptions. An alpha animal may preferentially mate with a lower-ranking animal, especially if the other alpha is closely related (a brother or sister, for example). The death of one alpha does not affect the status of the other alpha, who will quickly take another mate. Usually, only the alpha pair is able to successfully rear a litter of pups (other wolves in a pack may breed, and may even produce pups, but usually they lack the freedom or the resources to raise the pups to maturity). All the wolves in the pack assist in raising wolf pups. Some mature individuals, usually females, may choose to stay in the original pack so as to reinforce it and help rear more pups. Most, males particularly, will disperse, however. Rank order is established and maintained through a series of ritualized fights and posturing best described as ritual bluffing. Wolves prefer psychological warfare to physical confrontations, meaning that high-ranking status is based more on personality or attitude than on size or physical strength. Rank, who holds it, and how it is enforced varies widely between packs and between individual animals. In large packs full of easygoing wolves, or in a group of juvenile wolves, rank order may shift almost constantly, or even be circular (e.g., animal A dominates animal B, who dominates animal C, who dominates animal A). Loss of rank can happen gradually or suddenly. An older wolf may simply choose to give way when an ambitious challenger presents itself, yielding its position without bloodshed. On the other hand, the challenged individual may choose to fight back, with varying degrees of intensity. 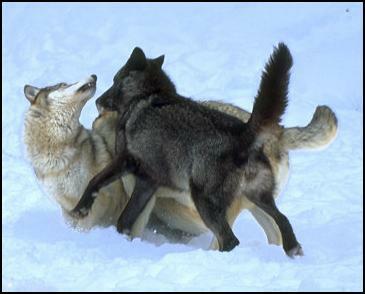 While the majority of wolf aggression is non-damaging and ritualized, a high-stakes fight can easily result in injury for either or both parties. The loser of such a confrontation is frequently chased away from the pack or, rarely, may be killed as other aggressive wolves contribute to the insurgency. This kind of dominance encounter is more common in the winter months, when mating occurs. Wolves will defend there territory, they work as a pack to harass larger animals like bears, although a pack of 12 were once known to kill a grizzly bear, most times if the animal runs away the wolves will not attack. Coyotes - They will avoid wolves most times. but when encounters occur they are aggressive. Grizzly bears - Are known to eat wolf pups, wolves will chase away bears from the den area. Cougars - Although rare in nature, the cougar being a lone hunter is at a disadvantage in a fight with a wolf pack. Foxes - Foxes have been observed stealing from wolf kills, wolves have been know to steal fox dens, wolves have been known to kill foxes, though it is rare, more often than not they ignore these tiny predators, the exceptions is in the arctic region where wolves will usually kill a fox on sight. Ravens - One of the most fascinating relationships between animals is the one that seems to exist between wolves and raven. The raven, scavenger of food of all types, will often follow wolf packs in hopes of morsels of food. and wolves have learned to watch for circling ravens as a sign of possible food below. Dogs - Although wolves are physiologically capable of breeding with dogs, such crossed usually happen in captive situations, trappers tales of wild wolves mating with dogs is usually a campfire myth. Most encounters between wild wolves and dogs are aggressive in nature, it is only natural a dog would be a trespasser in a wolf's territory, small yapping dogs may be attacked as nuisances. Wolves communicate not only by sound (such as yipping, growling, and howling), but also by body language. This ranges from subtle signals-such as a slight shift in weight-to the obvious, like rolling on the back as a sign of submission. Dominance - A dominant wolf stands stiff legged and tall. The ears are erect and forward, and the hackles bristle slightly. Often the tail is held vertical and curled toward the back. This display shows the wolf's rank to all others in the pack. A dominant lupine may stare penetratingly at a submissive one, pin it to the ground, "ride up" on its shoulders, or even stand on its hind legs. Submission (passive) - Passive submission is more intense than active submission. The wolf rolls on its back and exposes its vulnerable throat and underside. The paws are drawn into the body. This is often accompanied by whimpering. Anger - An angry lupine's ears are erect, and its fur bristles. The lips may curl up or pull back, and the incisors are displayed. The wolf may also snarl. Fear - A frightened wolf tries to make its body look small and therefore less conspicuous. The ears flatten down against the head, and the tail may be tucked between the legs, as with a submissive wolf. There may also be whimpering or barks of fear, and the wolf may arch its back. Defensive - A defensive wolf flattens its ears against its head. Aggression - An aggressive wolf snarls and its fur bristles. The wolf may crouch, ready to attack if necessary. Suspicion - Pulling back of the ears shows a lupine is suspicious. In addition, the wolf narrows its eyes. The tail of a wolf that senses danger points straight out, parallel to the ground. Relaxedness - A relaxed wolf's tail points straight down, and the wolf may rest sphinxlike or on its side. The wolf's tail may also wag. The further down the tail droops, the more relaxed the wolf is. Tension - An aroused wolf's tail points straight out, and the wolf may crouch as if ready to spring. Happiness - As dogs do, a lupine may wag its tail if it is in a joyful mood. The tongue may loll out of the mouth. Hunting - A wolf that is hunting is tensed, and therefore the tail is horizontal and straight. Playfulness - A playful lupine holds its tail high and wags it. The wolf may frolic and dance around, or bow by placing the front of its body down to the ground, while holding the rear high, sometimes wagged. This is reminiscent of the playful behavior executed in domestic dogs. Wolves have a very good sense of smell Research shows wolves have been able to detect their pray at distances of up to 1.75 miles (3 kilometers), which they also use to communicate. 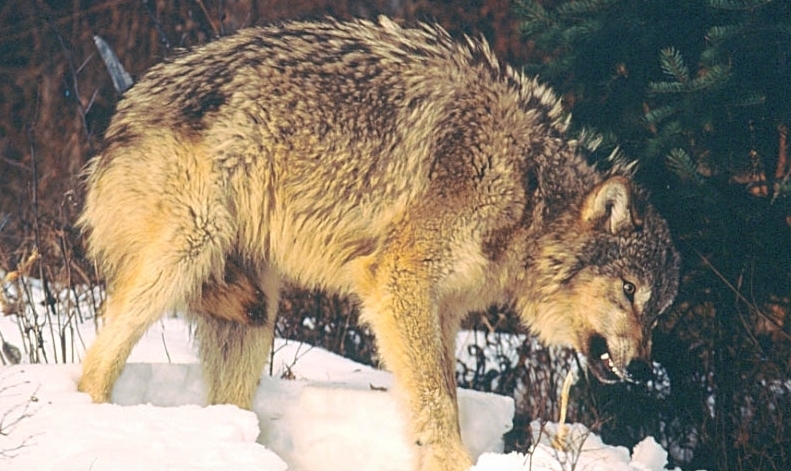 Wolves mark their territory with urine and faeces. This is called scent marking. When "outside" wolves smell this, they know that an area is already occupied. Of course, their sense of smell also tells them when food or enemies are near. Wolves howl for several reasons. Howling helps pack members keep in touch, allowing them to effectively communicate in thickly forested areas or over great distances. Furthermore, howling helps to summon pack members to a specific location. Howling can also serve as a declaration of territory, as portrayed by a dominant wolf's tendency to respond to a human imitation of a "rival" individual in an area that the wolf considers its own. This behavior is also stimulated when a pack has something to protect, such as a fresh kill. As a rule of thumb, large packs will more readily draw attention to themselves than will smaller packs. 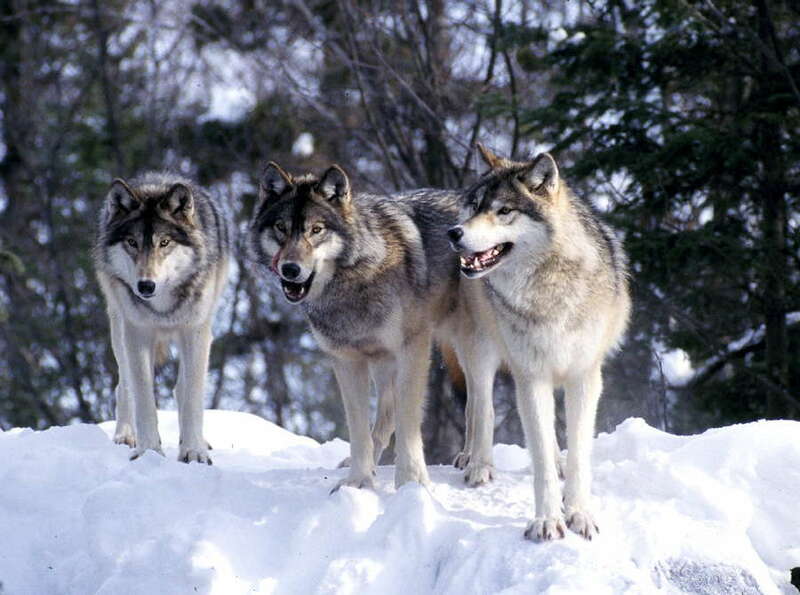 Adjacent packs may respond to each others' howls, which can mean trouble for the smaller of the two. Thus, wolves tend to howl with great care. Wolves will also howl for communal reasons. Some scientists speculate that such group sessions strengthen the wolves' social bonds and camaraderie -- similar to community singing among humans. During such choral sessions, wolves will howl at different tones and varying pitches, which tends to prevent a listener from accurately estimating the number of wolves involved. This concealment of numbers makes a listening rival pack wary of what action to take. For example, confrontation could mean bad news if the rival pack gravely underestimates the howling pack's numbers. Observations of wolf packs suggest that howling occurs most often during the twilight hours, preceding the adults' departure to the hunt and following their return. Studies also show that wolves howl more frequently during the breeding season and subsequent rearing process. The pups themselves begin howling towards the end of July, and can be provoked into howling sessions relatively easily over the following two months. Such indiscriminate howling usually has a communicative intent, and has no adverse consequences so early in a wolf's life. Howling becomes less indiscriminate as wolves learn to distinguish howling pack members from rival wolves. Far across the tanana, a mile or two to the south of us, a group of wolves were singing. I call it singing, not howling, for that is what it was like. We could distinguish three, perhaps four voices - wavering, ascending in pitch, each one following the other, until they all broke off in a confused chorus. Their voices sank into distant echoes on the frozen river, and began again. A light and uncertain wind was blowing out there, and the sound grew and faded as the air brought it toward us or carried it away southward. It might have come across a thousand years of ice and wind-packed snow, traveling as the light of the stars from a source no longer there.